Born in 1880, Arthur Dove was a master of abstraction, light, and color, always seeking to capture the hidden rhythms and feeling of his given environments—whether natural or man-made. 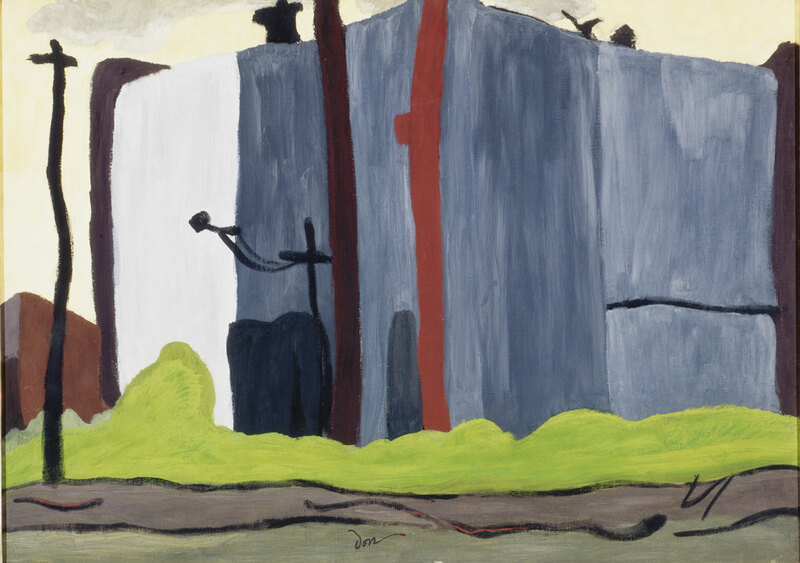 In Power Plant I (1938), Dove transforms a looming building into shifting planes of color and shape. The plant, its smoke stacks, and surrounding telephone poles are in reality solid and immutable, but Dove renders them formless, with all dimensionality equalized on the canvas. It is sometimes refreshing just to be painting with no plans; by that I mean pure painting, with no further intention. It has a tendency to make one feel the two-dimensionality of a canvas, a certain flatness which is so important in the balance of things, and often so difficult to attain. Pure painting is extremely helpful in finding one’s own instincts. It helps us to see how much stronger is our imagination than our intellect. There is too much of the intellectual in art nowadays, and pure painting tends twoard [sic] the elimination of this intellectual forcing process. We must learn by our own mistakes and find our own find. Profiting by the mistakes of others, and building up knowledge through the findings of others may make an artist successful but it will never make him creative. They may say that we cannot create anything, that everything has been done. Perhaps, it doesn’t matter—if we have not done it. That may be the real reason that I am writing this—because I have never done it.,[sic]—instinctively I dislike the idea of writing “about” things and painting “about” things. Have always felt that it is much better to write things and paint things that exist in themselves and do not carry the mind back to some object upon which they depend for their existence. We lean too heavily on nature. I would rather look at nature than to try to imitate it. In the same way I enjoy looking at a Greco, a Cezanne [sic], or an Afircan [sic] sculpture, but have no desire to do one. And if we find at any time that we are depending too much on any one thing, we will also find that it is by just that much that we have missed finding our own inner selves. Arthur Dove essay, “Me and Modern Art,” not after 1946. Arthur and Helen Torr Dove papers, 1905-1975, 1920-1946. Archives of American Art, Smithsonian Institution.